Love In the Name of Christ mobilizes churches to meet the needs of people. So when a Love INC affiliate discovers an unmet need in the community, it finds a way to help churches meet that need. One way that Love INC helps churches help people is through Gap Ministries. The purpose of a Gap Ministry is to provide a resource or service to meet ongoing needs that are not currently being met by agencies, government, or churches. Love INC helps churches “fill in the gap.” Because the Love INC Clearinghouse secures current and relevant information on the unmet needs, Love INC can provide valuable insights on new ways churches can meet those needs and have a deeper impact in the lives of people and the community. As gaps in community services are identified through the Clearinghouse process, a list is compiled and can be shared regularly with churches, pastors, and volunteers. Love INC encourages churches to respond and assists churches in developing an individual church ministry, joint church ministry, or collaborative ministry (all church partners) to fill the gap in services. Gap Ministries are most often staffed by volunteers and only meet needs referred by the Clearinghouse. 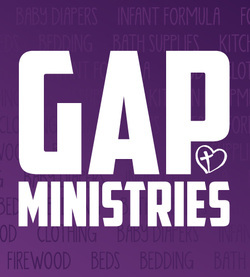 We currently have the following GAP ministries: Household consumables, hygiene supplies, durable medical goods, firewood, diapers, wipes and formula, linens, towels and blankets, maternity clothes, kitchen ware: dishes, pots and pans, glasses etc, baby blankets, caps, bottles, pumps, clothing and shoes. We also have seasonal ministries; a school supply giveaway in August, coat giveaway in October and Christmas presents for children in December.